Pull'R has dropped from their inventory the Rolling Tool Organizer (Model 40513) reviewed in March 1999. However, they are keeping their Pro version, so this updated review reflects this product. 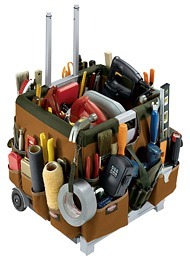 If you're a BucketBoss bucket tool organizer owner, I recommend that you check out the Pro Rolling Tool Organizer. The original design concept is similar to small black pull-behind suitcases used by millions of travelers. It features soft rubber wheels that won't scratch the floor and a retractable handle. Think of it as "a Crate Boss with a license to drive." The round handle has been changed to a square tube design. I couldn't wait to unorganize my Rolling Tool Organizer and reorganize myself into the Pro Rolling Tool Organizer. It works great! The interior size of the crate has changed from 13.5" wide by 11" deep by 12" high to 15.25" wide by 12.50" deep by 13.50" high, making the pro version somewhat larger than the standard version. The crate itself has built-in handle slots to make it easy to pick up the entire unit, for example, off a pickup bed. Because the crate interior is so open (compared with the original BucketBoss bucket organizer), solid half- or four-way dividers would help. This would be an accessory that I would gladly purchase. Once the unit is on the ground, its built-in retractable handle extends up to 39" and allows you to easily roll the unit. The handle release has been relocated from the crate and is now built directly into the handle. Unfortunately, this precludes use of the fabric padded handle. Perhaps the fabric handle will be redesigned with a hole to accommodate the handle release button. The unit now has 58 (up from 52) denier fabric pockets to help organize a wide range of hand tools. They are well designed for most tools and even include a drill holster with drill bit pockets. However, after organizing my tools into them, I discovered that this unit needs the same changes that I wanted to see made to the original unit to make it a little more user-friendly. Because I use framing and finish hammers with longer handles, the single-loop hammer holders in two of the cart's corners don't hold my hammers. The sheer weight and long handles cause the hammers to slide down the loop toward the center of the crate. A second loop sewn into the bottom would permit the hammer to stand in position. Actually, it would be nice to have loops in all four corners for those who use more than two hammers and various sized crow and/or wonder bars. After using a BucketBoss bucket organizer for a few years and a standard (smaller) version of the Rolling Tool Organizer, I find that I like and prefer the Pro Rolling Tool Organizer. BucketBoss has its place, but my work habits have changed. "Keep rollin', rollin', rollin'... Though the crate is swollen... Keep them tools a rollin'... Fill 'em up, roll 'em out, roll 'em out, load them up, move 'em on, roll 'em out..." It's cute, and it really applies to the Pro Rolling Tool Organizer. Copyright © 03/06/99, 03/21/2006, & 08/04/06 LAF/C.R.S., Inc. All rights reserved.